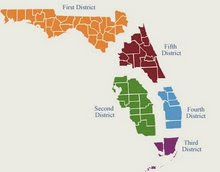 In San Marco Realty, Inc. v. Dopierala (2D08-1928), the Second District reversed the circuit court's order granting a judgment notwithstanding the verdict. "We conclude that the trial court improperly granted the Dopieralas' posttrial motion. The record reflects that there was conflicting evidence as to whether San Marco or FWS was responsible for maintaining the sewer system and manhole cover. Accordingly, based on the evidence presented at trial, the jury was entitled to conclude that FWS was responsible for maintaining the sewer system, was responsible for the defective manhole cover, and thus was responsible for David Dopierala's injuries. " '[U]nless the evidence as a whole, with all reasonable deductions to be drawn therefrom, points to one possible conclusion, the trial judge is not warranted in withdrawing the case from the jury or in setting aside the jury's determination on conflicting evidence and substituting therefor his own evaluation of the evidence.' " Pahucki v. Armster, 161 So. 2d 719, 722 (Fla. 2d DCA 1964) (quoting Cash v. Gates, 151 So. 2d 838 (Fla. 2d DCA 1963)); see also N. Dade Golf, Inc. v. Clarke, 439 So. 2d 296, 298 (Fla. 3d DCA 1983) ("[A] trial judge is not authorized to act as a 'seventh juror' or to substitute his judgment for that of the jury on disputed questions of fact.") (citations omitted)."